“Montana, Wyoming and Nebraska – states with typically high numbers of grasshoppers due to the large expanses of open range land there – are already seeing more than eight grasshoppers per square yard. That’s like walking through a field and having eight grasshoppers fly in your face with every step.” For Live Science, Brett Israel writes about what forecasters say could be a peak year for hopper reproduction in the U.S. West. But Washington State University entomologist Richard Zack says that despite this year being a peak in the cycle, recent cool rains in the northwest may make it difficult for grasshoppers to reproduce in that region. 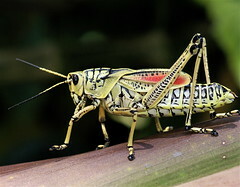 There is still a chance, though, that a grasshopper explosion could occur: “‘So this would be like biblical, where when they come through an area, they just start eating everything,’ Zack said. ‘There are massive numbers of them, and then when they exit that area, pretty much anything green is gone. '” From the Associated Press.